New Delhi: The government agency that buys cotton from farmers—Cotton Corp. of India Ltd, or CCI—will suffer a loss of about Rs2,065 crore if it has to buy one-third of the entire crop of 33 million bales this year, a government official said here on Tuesday. At present, the corporation has a budget of Rs135 crore for lifting stock from farmers, which Singh says is “grossly inadequate". The government steeply hiked the MSP for cotton by 46% in September prior to the onset of the harvest season; domestic prices now rule higher than the international cotton prices that have slipped due to slowing consumption. Meanwhile, ginners, who separate the cotton from the seed, began a two-day strike on Tuesday, to demand concession against the cotton price hike, saying the current support price at Rs2,850 is unviable when international rates have tumbled 50% in four months to Rs500 a quintal. There are 4,000 ginning mills across the country, which employ about two million people. 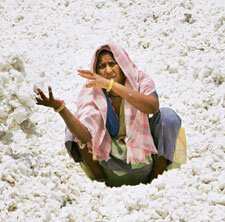 At present, the corporation has a credit limit of Rs5,000 crore for cotton collection efforts. The textiles ministry has asked its finance counterpart to raise the limit now to Rs15,000 crore for swift collection and disbursal of the commodity. R.K. Dalmia, chairman of the Confederation of Indian Textile Industry, which has more than 500 industry association as members, said on the telephone from Mumbai that the government must allow textile mills to buy cotton by easing supply of working capital and offer 7% interest rate on par with agricultural commodities. He also said banks should reduce the loan margin from 25% to 10% and extend the repayment period from four months to nine. The government fixes the minimum support price for farm commodities on the recommendations of the Commission for Agricultural Costs and Prices to protect farmers’ income. About 24 commodities, including rice, wheat, cereals, pulses and cotton have individual minimum support price rates, which the commission suggests after calculating several parameters, including cost of cultivation, comparison of international and domestic prices and earnings from competing crops. The commission finalized the support price for cotton in February this year, eight months prior to the formal announcement in September. An official in the agriculture ministry, who declined to be identified, said, the final rate was fixed before the global market slump when international cotton prices were peaking with growing demand. “The input costs for farmers have risen by 15% in the past two-three years. There must be some margin for farmers, otherwise why should they produce it?" he asked.